The tweeter used in the B&W 685 loudspeaker is a 25mm aluminium dome mounted in a type of “Nautilus” style plastic tube housing with an optimized rear chamber. 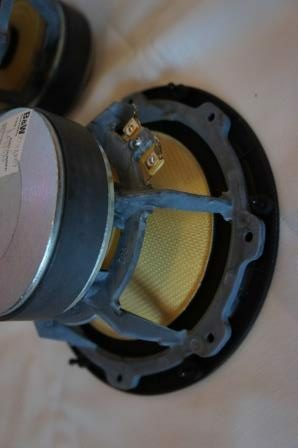 The tweeter is fitted with neodymium magnets which make the tweeter size smaller and it allows for a tighter center to center distance between the mid-woofer and tweeter on the baffle. 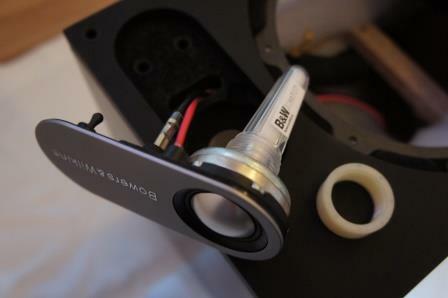 The tweeter is mounted on a design frame and is attached to the baffle with a plastic nut screwed from behind. I don’t have the official specification for this tweeter, but it’s a 4 ohm tweeter with a medium high/low resonance frequency of around 800Hz and an estimated average sensitivity of about 90dB 2.83v/1m. The two tweeter samples measures virtually the same. From the suppressed impedance peak at the resonance frequency, it looks like this tweeter uses ferrofluid in the magnetic gap. 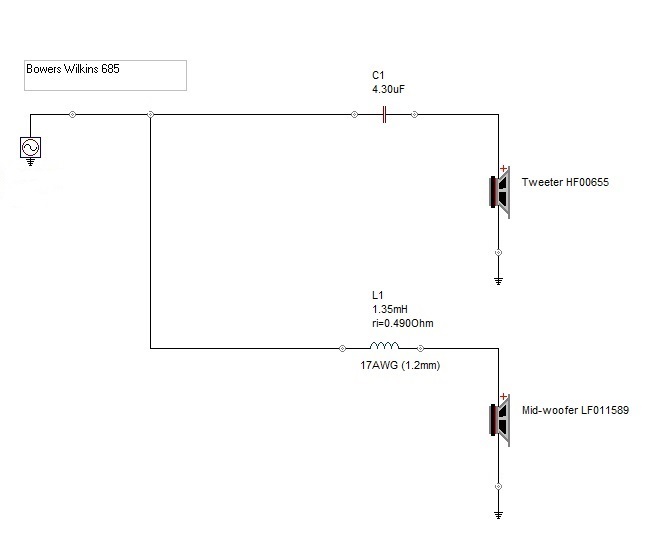 The following frequency measurements of the HF00655 tweeter are made at 1m distance. All frequency response charts are presented in a 50db scale with 1/24 octave smoothing and the measurements are valid down to 275Hz. Upper left: On-axis frequency response, sample #1 vs. #2. 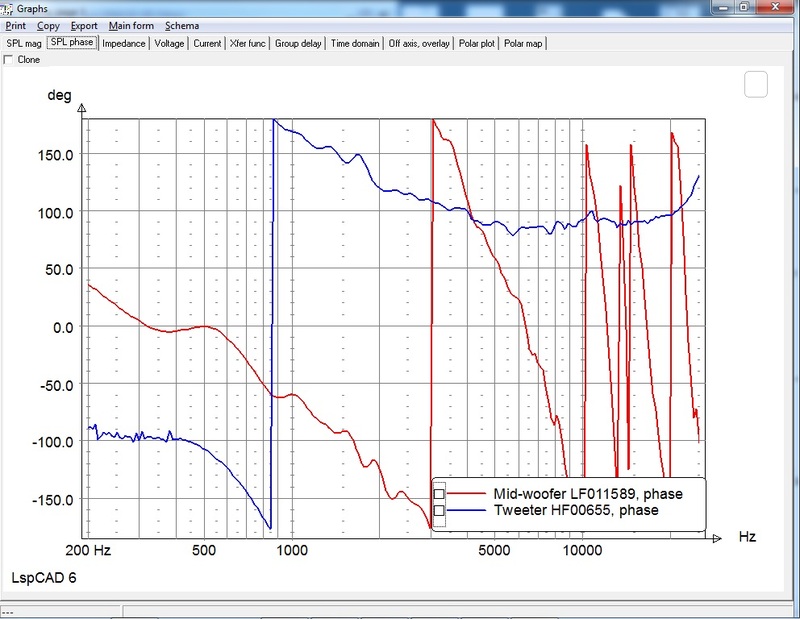 Upper right: 15deg off-axis frequency response, sample #1 vs. #2. Lower left: On-axis, 15, 22.5deg off-axis frequency response. Lower right: 30, 45, 60 off-axis frequency response. Nice conformity between the two tweeter samples. Very linear frequency response with a small level reduction between 5-11kHz. The metal dome break-up mode is at 31kHz, which is slightly higher up infrequency for an aluminium dome in this size. Even at higher levels, this tweeter has excellent distortion performance. The odd-order distortion is low in its entire useable frequency range. The second and third-order distortion start to increase below 2kHz, which is about the lowest usable cross-over frequency for this tweeter. 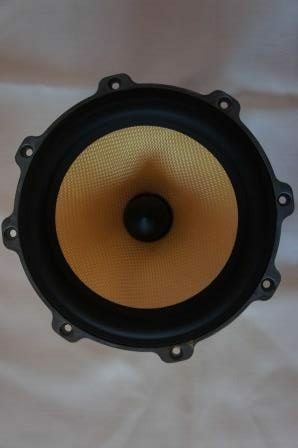 The mid-woofer used in the B&W 685 is a 4 ohm 6.5” driver in a molded chassis. 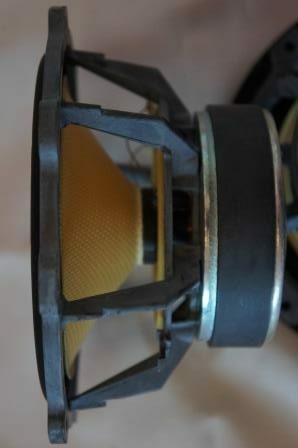 It has a yellow Kevlar cone with a real phase plug, not a fake one attached to the cone as often seen in cheap loudspeakers. It also has a large 100x20mm magnet and this mid-woofer weighs a healthy 1.95kg. The cone area (Sd) is specified excluding the area occupied by the phase plug. The mid-woofer has high sensitivity and resonance frequency and at the same time high Qms and low Rms. This mid-woofer will not play so deep, but will probably sound “fast” and articulate in the right box alignment. Left: = Mid-woofer sample #1 vs. #2. Right: = Mid-woofer sample #1 vs. #2, zoomed. 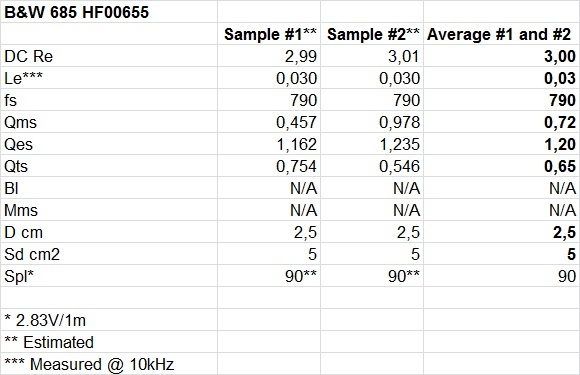 Very good conformity between mid-woofer sample #1 and #2. When zoomed in, you can see some sort of resonance issue between 0.8-1kHz. This shows up as an elevated second-order distortion in the distortion measurements. I don’t know exactly the cause of these resonances, but usually at these frequencies it’s caused by a cone-edge resonance. 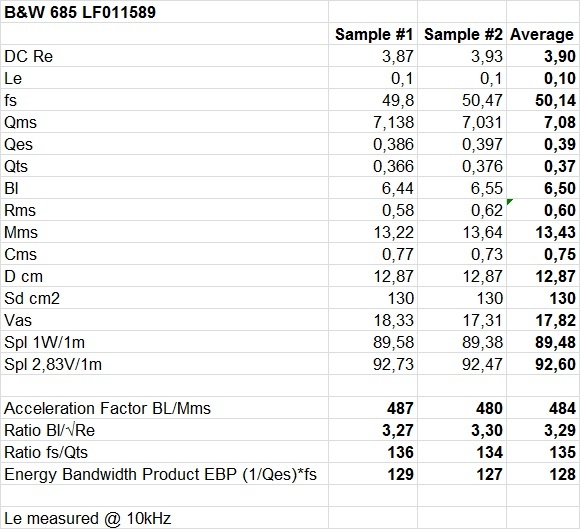 The following frequency measurements of the LF011589 mid-woofer are made at 1m distance. 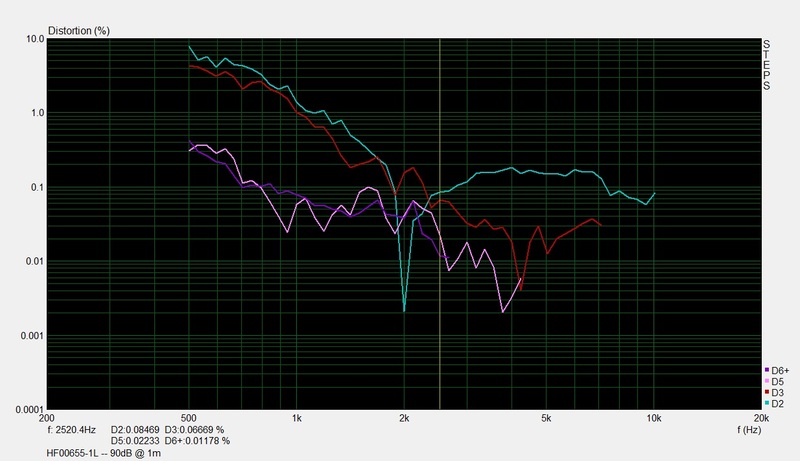 All frequency response charts are presented in a 50db scale with 1/24 octave smoothing and the measurements are valid down to 275Hz. Good conformity between the two mid-woofer samples. There are small ripples in the frequency response, but the frequency response is rather linear up to 4kHz where it starts to smoothly roll off. A cross-over point up to 2.5-3kHz would work fine for this mid-woofer. This mid-woofer has a very low distortion profile. We can see a second-order distortion peak at the same frequency (0.8-1kHz) as the impedance plots indicated some sort of resonance. However, the second-order distortion is relatively harmless and can in this case be ignored. The odd-order distortion profile is low throughout the usable frequency range. The cross-over is very simple and is mounted with four screws directly on the backside of the binding post. Attached to the cross-over board there are rather thick wires connected. Black (-) and red (+) for the tweeter and blue (-) and brown (+) for the mid-woofer. The binding posts are of high quality and allows for bi-amp or bi-wire configurations and if the safety plugs are removed, it also accepts banana plugs. It doesn’t get simpler than this! 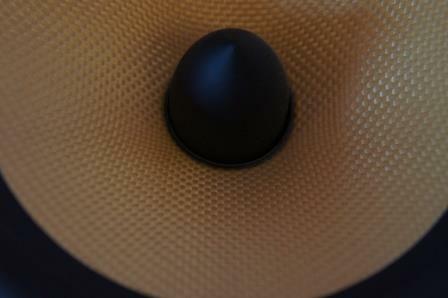 Only a cap for the tweeter and a coil for the mid-woofer cross-over section. Both the tweeter and mid-woofer are connected with positive polarity. The cross-over components are of good quality. 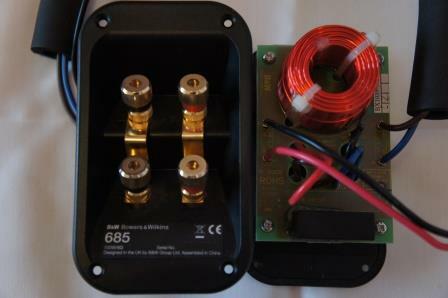 The inductor for the mid-woofer section is an air-coil with a 1.2mm wire (17AWG). 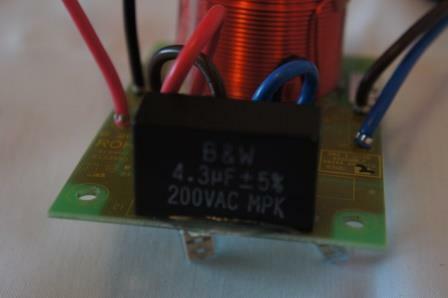 The capacitor (MPK) for the tweeter section is of unknown origin. The actual component values are well within specification. The review part 2 showed how the system frequency response looked like and here’s a closer look on how the cross-over is implemented. As can be seen above, the cross-over point is at 4kHz. 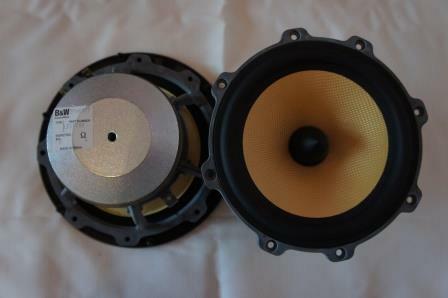 Both the tweeter and mid-woofer initially roll off at 6dB/octave. This cross-over is what you would call a first-order filter topology (acoustical) or at least in theory. With a tweeter reverse polarity check, we can see that the tweeter and the mid-woofer show a deep notch, indicating that the driver units have a good phase tracking at the cross-over point. However, above and below the 4kHz cross-over point we can see a poor phase tracking between the driver units. This is one of the reasons why I think this loudspeaker doesn’t sound so coherent. The tweeter and the mid-woofer don’t blend the sound to one point source of sound. Instead they both live their own life when playing music and this is especially noticed on the tweeter due to its elevated frequency response above 9kHz. 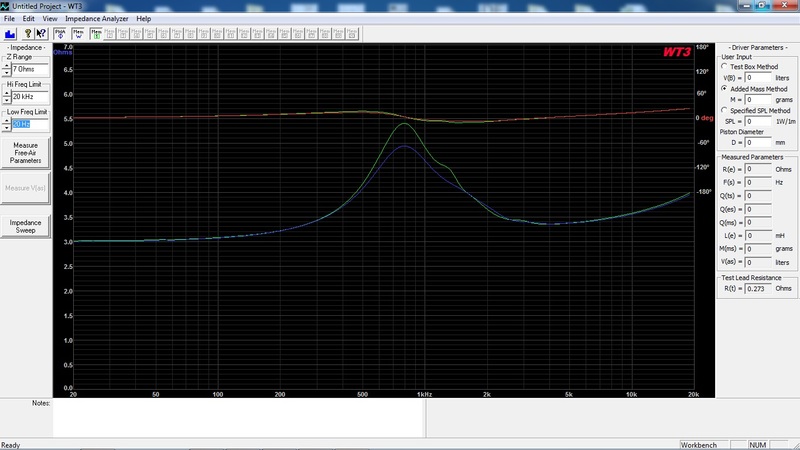 We also have a 5dB boost at the cross-over frequency which makes the sound a bit unbalanced. 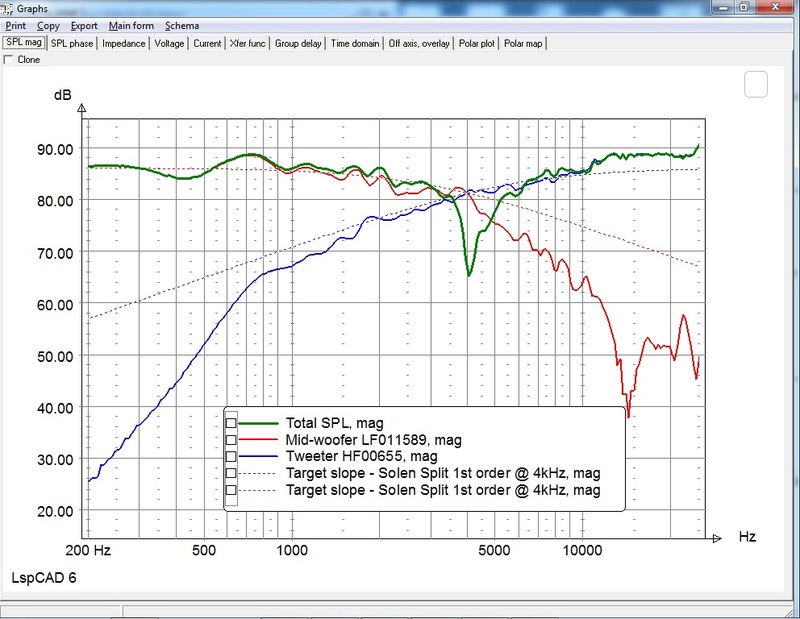 First of all I must say that I’m impressed by the quality of the drivers used in the B&W 685 loudspeaker. It’s not often you see such driver performance in a loudspeaker in this price range. The mid-woofer has high sensitivity and has no violent cone break-ups and would also probably work nicely as a mid-range in a larger 3-way system. The tweeter is also of high quality and has a nice performance with a dome break-up mode high up in frequency at 31kHz as well as a good distortion profile. The shape of the tweeter face-plate though, could be a limiting factor if used in another loudspeaker enclosure. My main hesitation to this loudspeaker as a whole is the shortcomings in the cross-over design. A first-order phase and time coherent (6dB/octave) cross-over topology design might be very tempting in theory. In reality it’s very hard to pull off such a design and in this case it’s more a marketing and a simplistic design approach. The result is good for a loudspeaker in this price range, but far from optimal considering the quality of the drivers used in it and what they are capable of. In the next review part I will describe and suggest some cross-over modifications and improvements that can be done for the B&W 685 loudspeaker. 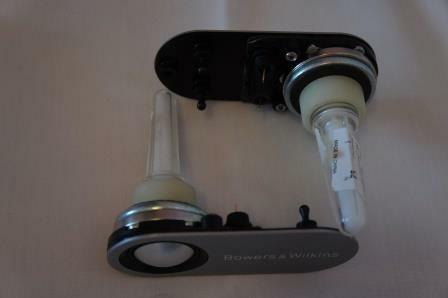 Go to Bowers & Wilkins 685 review part 4.